Coast Gravity Park Announces May 10th Opening!!! "We are very excited to announce our opening date will be May 10th, 2014 ! You can now go to our website to book your riding days in advance. For 2014 we are opening with a shuttle service to get you to the top of our trails. To provide you with the best experience possible we have limited amount of seats available per day, so book now and come enjoy the freshest trails out there! CGP is a work in progress, and will be constantly evolving and changing around you and your feedback. From new trails & amenities all the way up to future lift plans, it will all be built around ridership. More riders means more trails. To grow we need you out here on our trails. Book Now!!" Nov. 9, 2013 - Crowdfunding for the Coast Gravity Park ended last night at midnight. With a goal of $100,000 a lot of people thought they were crazy and didn't have a hope in hell of reaching it. Well those people were right, but only barely! The final total was $94,596.00, just shy of their $100,000 goal! Amazing, but no real surprise to those who believe in this project. “Special Preview Days” will open up in December and our Indiegogo Contributors will have the first opportunity to redeem their day passes and attend these extraordinary events. As the lift will not be complete at this time we will “shuttle” riders up the mountain. I ended up purchasing at the $120 level which gives me four - one day passes. I've decided to pass them along to some young people in our communities who would otherwise may not have this opportunity. Two of the passes will go to JF at Spin Cycles and the other two will go to Gary and Lydia at Off the Edge with the hope that they know of some deserving recipients. I think we can look forward to a "wild ride" over the next few years and I can't wait to see where the dreamers who are making this happen take us. Oct. 27, 2013 - Yesterday was the much anticipated Coast Gravity Park Reveal. It was an invitation only event and included food, beverages and entertainment by some of our talented local riders who got some serious air on the jumps. I took lots of photos and selected a few of my favourites and created a short video. Check it out! The people responsible for making this park happen were introduced and include three generations of Stockwells, the Coastal Crew and Darren Hemstreet. The park is divided in two by the Sechelt Crucil logging road. The bottom half is the jump park and meant for more advanced riders (rated double black diamond). However, the upper half of the park is going to include a lot of trails meant for all levels of riders. Right now the trails up there are steep, smooth and flowy (signature Coast Crew design). There will be a mixture of downhill and cross country when building is complete. Something for everyone! Oct. 14, 2013 - I was lucky enough to be invited up to the Coast Gravity Park for a personal, exclusive preview. Wow, I was blown away. This is going to be an amazing park and I can't wait for it to be open. I don't think anyone will be disappointed and it will offer trails for everyone, including cross country. And wait til you see the extreme jump trak! Because the park hasn't officially be revealed to the world I was not allowed to take any photos inside the park itself, but I did get a couple of "legal" photos to post here. Entrance to the double black diamond Jump Trak. View of Sechelt Inlet from near the Gravity Park. Oct. 8, 2013 - Tuesday evening the news hit - Coast Gravity Park coming soon! 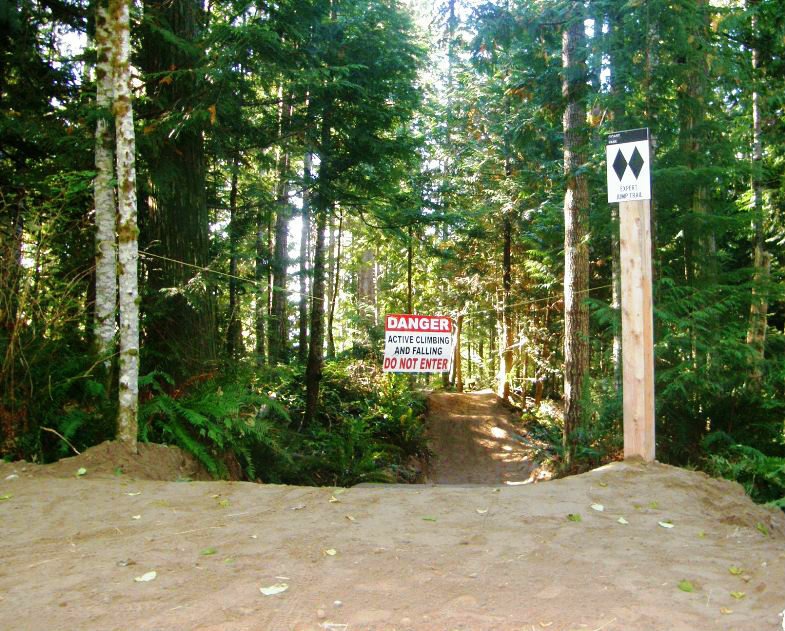 The Coastal Crew announced that for the past several months they’ve been building trails on a private piece of property in Sechelt for the only almost year round, lift access gravity park in the Pacific Northwest. The Sunshine Coast was already a world class mountain bike destination, but now it will be off the charts. 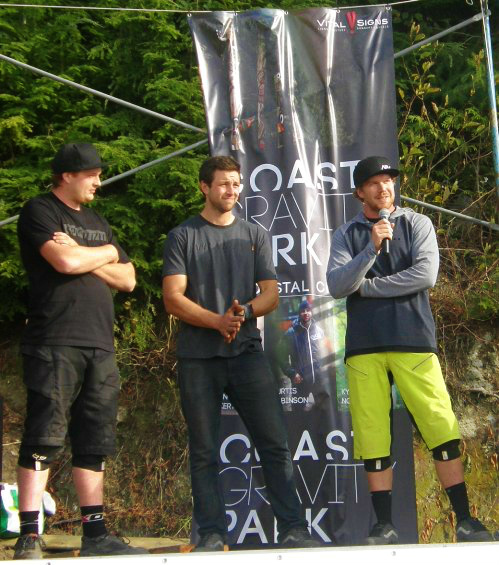 Who: Trail Designers and Head Builders are Kyle Norbraten, Curtis Robinson and Dylan Dunkerton of Coastal Crew fame. The Coastal Crew is a group of young, well-known mountain bike riders, trail builders and videographers with a true passion for what they do. They’ve built countless trails and signature features for several pro riders and high end films and these trails have drawn riders from around the world. Their latest film called Arrival has just been released and you can check out the trailer here. Some of this film was filmed in the park! What: The Coast Gravity Park will be unique because it is not much above sea level so there will likely only be a handful of days a year when snow will force closure. Other gravity parks in North America are associated with ski hills so are only open for at most six months of the year. 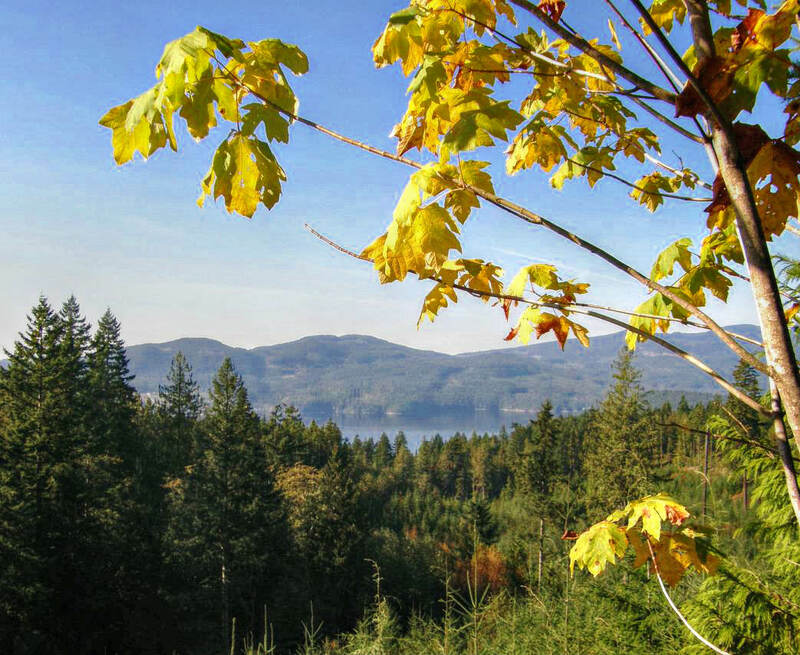 Where: This privately owned, 160 acre park is located on the eastern shore of beautiful Sechelt Inlet, just minutes away from downtown Sechelt itself and approximately 2 hours away from Vancouver. When: Bids are now being accepted from lift manufacturers with an installation window between summer 2014 and spring 2015. However, starting in early 2014 there will be exclusive park preview days for those who contribute $50 or more to the fundraising campaign. So far the $120 4-day pass seems to be the most popular. For more information on how you can contibute and what perks you get when you do, check out http://www.indiegogo.com/projects/coast-gravity-park-campaign. As I get more information and photos I will post them to this page. 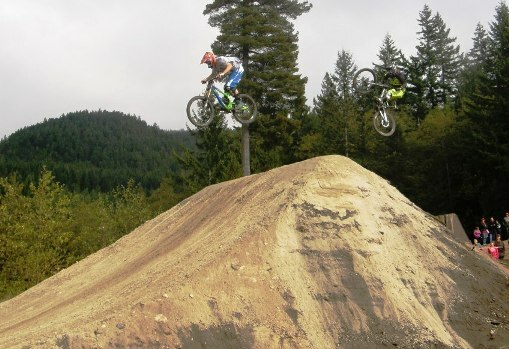 Click here to return from Coast Gravity Park to the Sunshine Coast Trails Home page.